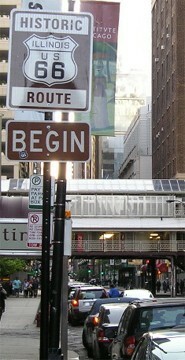 If everyday Americans were asked whether they could name a specific location where a US highway begins or ends, few people would be able to come up with any answer, but out of all 1300+ current and historic endpoints, likely one of the most common responses would be "the intersection of Jackson and Michigan in Chicago". US 66 ended at that particular intersection for only about 12 years. 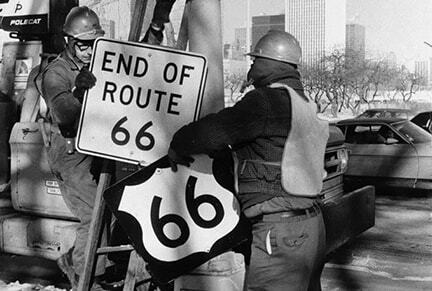 US 66 had a different Chicago endpoint that lasted for more like 40 years. Jackson and Michigan marked the endpoint of four other US routes in addition to US 66. 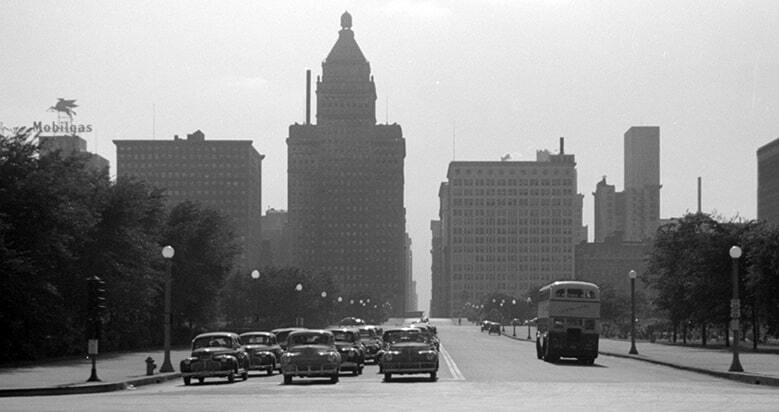 ​But already for years prior to that, the Jackson/Michigan intersection had been known as the "route center" of Chicago. In other words, highway route mileages were measured from this intersection, so it had always made sense for highway traffic to be routed to this intersection. This is evidenced by the note at far right on that map. Another original route was US 330 (also visible on the map above). It came into Chicago on Roosevelt Road, but that was not a through road at the time (because a rail station was in its right-of-way). So US 330 traffic was directed north (perhaps on Austin Boulevard?) to Jackson, and then continued east again. At the intersection with Ogden, it picked up US 66-32, and the three routes were overlapped along Jackson to a common terminus at Michigan: the one pictured at the top of this page. There, Lake Shore curves to the left, but at right another road is visible heading off into the distance: that is Inner Lake Shore, which becomes Sheridan in a couple blocks, so that represents the east beginning of US 32. That photo was looking east where Jackson ends at Lake Shore, and Chicago Harbor on Lake Michigan is visible in the background. That was US 34's terminus until 1970 (when it was truncated back to its present endpoint at Harlem Avenue). 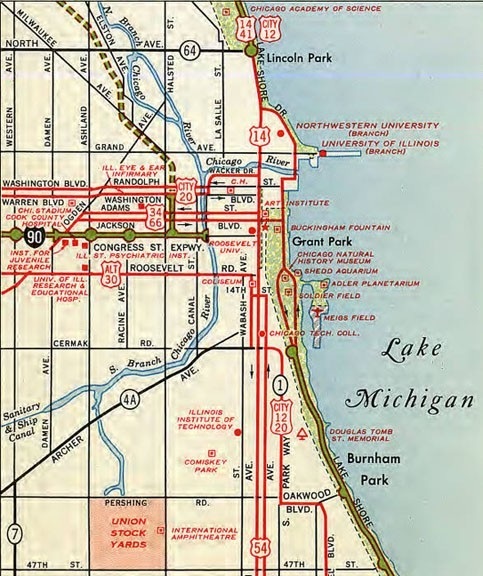 Then for an additional six years that remained the east terminus of US 66 (for a total of almost 40 years), until 1976, when the route was decommissioned in Illinois. ...and visible at lower right were the first westbound shields for US 34 and US 66. US 66 never actually began at Adams and Michigan, but that does not detract from how well historic US 66 is signed throughout Chicagoland. US 54 was decommissioned out of Chicago in 1972. 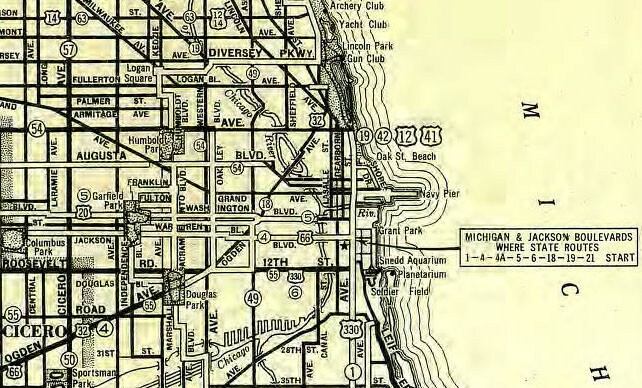 US 14 continued to end at Jackson until 1978, when it was truncated to its current terminus on Broadway at Foster. last updated Dec. 6, 2018.